The chandelier is a signature of lighting design and has been one throughout the years, but its history goes back even further than people may think. Over the centuries, the chandelier has evolved, taken on new designs, spread all over the world and gone from holding candles to electric light bulbs, but the main idea of a marvelous centerpiece of lighting remains. This look at the multifaceted history of the chandelier is not exhaustive, but does cover many periods of time and how people lit their spaces in each one. 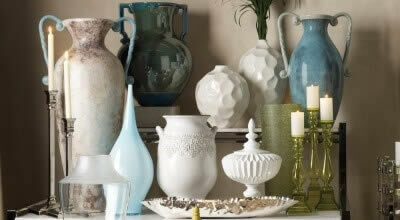 Ancient Sumerian and Egyptian artisans crafted molded candles, alabaster lamps and colored glass. 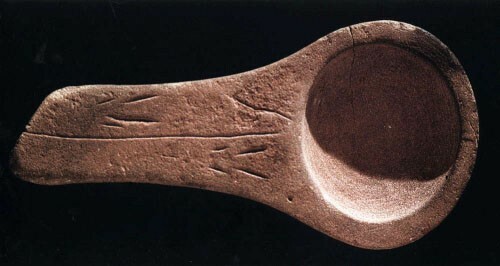 Egyptian oil lamps included wick holes, indicating they used a different method of illumination than their caveman predecessors. Oil lamps were mass-produced in Egypt, Greece and Rome during this time. In fact, these lamps were the first ever mass-produced item, crafted using molds and materials like alabaster, stone, gold, bronze and terracotta. 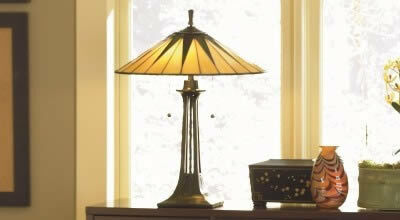 Roman lamps were especially well-known for their decorative attributes. Rooms with chandeliers in them often had holes for smoke ventilation and people learned to not spend a lot of time directly under chandeliers since they dripped. Candles were also so expensive and scarce that people hid them during the day. Burning a candle was a way to flaunt wealth: you were rich enough to afford candles and to burn them! Moorish hanging lamps of the 8th century were another kind of early chandeliers, infused with Islamic style that values geometry and symmetry in designs but forbids the depiction of any living things. A century later, the circular iron corona appeared in Europe. Meanwhile in Italy, Venetian glassmakers establish a guild in 1224 to help them practice their art. They moved their furnaces to the island of Murano in the 13th century because of the fire risk, which actually helped the guild keep their trade secrets and stay alive. When others around them were persecuted and killed, they were not because they practiced such a valuable craft. 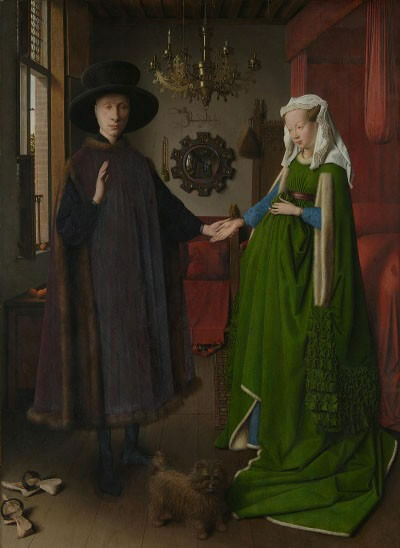 The earliest painting featuring a chandelier is Giovanni Arnolfini and His Wife (1434) by Jan Van Eyck. You can see the painting, with its ornate chandelier, at the right. Another style of chandelier, the Dutch brass ball-stem style that is still used today, is depicted in the 1663 painting The Dropsical Woman by Gerrit Dou, who was a student of Rembrandt. England imported a great amount of Dutch brass work, but then British crafters learned to reproduce the brass ball-stem style and later implemented crystal. Classic Dutch chandelier style is often used in churches and can sometimes still be seen there today. The first rock crystal chandeliers appeared in the 17th century. Rock crystals are actually as old as the Earth itself and every crystal is unique, created by geological events taking place over millions of years. Soon, French glassmakers were trying to emulate rock crystal with molded glass drops. In 1676, a Brit named George Ravenscroft patented a new kind of glass for crystals: flint glass, which contains a lot of lead oxide. The lead oxide makes glass clearer, easier to cut and prismatic. It takes color well, so people experimented with colorful glass, even trying to make yellow glass with uranium. At the same time, Venetian glass masters added molded glass flowers and leaves to chandeliers. They also crafted glass-arm chandeliers that were sometimes eight feet wide. In Bohemia (present-day Czech Republic), glassmakers began to make glass chandeliers, mimicking styles that were popular in France and Britain. However, sometimes they incorporated wood into their designs because it was plentiful. Bohemia was where Adolf Schonbek left the family business to start his own company in 1870, manufacturing glass chandeliers. Baroque and rococo styles emerged in the 18th century. Rococo was actually an evolution of Baroque popularized by published engravings that made people interested. Rococo chandeliers included lots of swirls, leaves, flowers, garlands, Cupids and other details, often cast in bronze. Also at the start of the 18th century, Peter the Great founded Saint Petersburg, Russia. His aim was to recreate all the cultural and architectural marvels of the Western world in this new city. Russian artists interpreted French styles, though they added their own touches to their chandeliers. Colored glass accents are a common detail of Russian chandeliers. Another outpost of colored glass in this time was Bristol, England. Located by the sea, Bristol was ideal for glass production since all the materials came in on boats. The high-quality glass produced there included touches like blue cobalt, gold ruby and translucent glass. In 1750, Bohemian glassmakers created Maria-Theresa style chandeliers. These are named for Marie Antoinette's mother, who was the Empress of Austria. See an example of a Maria-Theresa chandelier at left. The 1750s and 1760s showed the cyclical nature of fashion and design inspirations as archaeologists found the ruins of the ancient cities of Herculaneum and Pompeii. This made people look back to Mediterranean art for design cues. For example, James and Robert Adam actually took sketches of the Pompeii sites for inspirations. This event birthed the Neoclassical style of chandelier design. In another 18th century design style, William Parker took out the chandelier's ball stem and replaced it with a vase-shaped stem. He designed chandeliers for the Bath Assembly Rooms in England that are still there today. A taxation issue in late 18th century Britain further revolutionized chandelier design. The Glass Excise Act taxed all glass by weight, but Ireland was exempt, so the Emerald Isle became the place for glass. The famed Waterford Glass House was founded there during this time. In England, those who didn't leave adapted by using crystal drops cut from broken glass (which was more cheaply taxed), strung together to look like a tent, along with a bowl of more drops at the bottom. 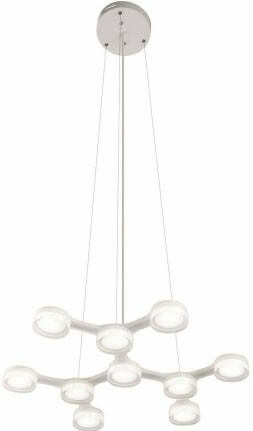 This is known as tent and bag style and inspired many, many other styles of chandelier. By the way, the Glass Excise Act was repealed in 1832. In 1760, the Industrial Revolution began. It changed the world: decorative objects were now available to more people and a new middle class was ready to show off their prosperity with fancy decorations like chandeliers. However, during the 1774 French revolution, Neoclassical style took root in France because it is rooted in ancient Greek designs and the ancient Greeks had democracy. Neoclassical is also much less adorned than what preceded it, which fit the political climate of revolutionary France perfectly. When Napoleon Bonaparte ruled France, he quite nearly destroyed the centuries-old practice of Venetian glassmaking when he sent troops to occupy Venice. The art survived, though. Speaking of revolutions, early Americans made chandeliers too, though they often used cheaper materials like tin, wood or metal with wire arms. This was just because sheet metal was really scarce in the fledgling country. The 19th century was one of style revivals all over Europe, proving again that the cyclical nature of fashion isn’t just a modern thing. Right at the start of the century, the French revived Roman lamps for use as chandeliers. But many of the revivals of older, more decorative styles happened because the growing middle class desired the way the old aristocracy lived. They looked to Rococo, Renaissance and Gothic design elements and filled their houses with chandeliers in those styles. 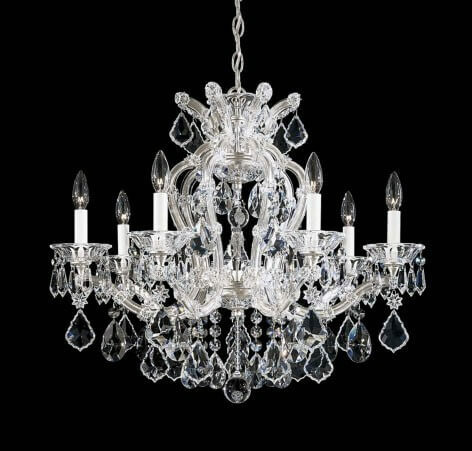 French chandelier makers, including Baccarat (which started making chandeliers in 1824), were especially eager to create new styles inspired by earlier periods. British chandelier companies looking for new sources of revenue also found one thousands of miles away in India, which was still a colonial holding at the time. Some companies even opened branches inside India to better cater to local tastes. When gas lighting became more widely available in the late 19th century, gasoliers making use of this new form of illumination were often designed in Rococo styles. These gasoliers usually had candles available as backup just in case the gas didn't work. 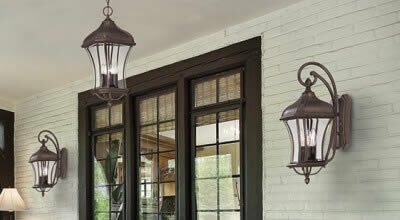 Gas lights were also really bright, so glass shields became more common as a way to shield the glare. 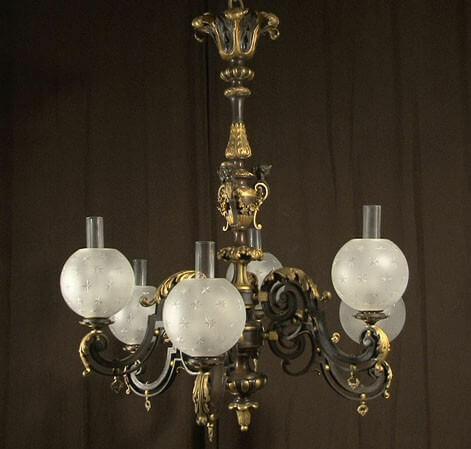 Here is an example of a gas chandelier, showing the glass shields and the ornate Rococo decoration. 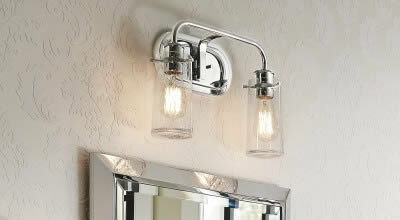 The electric light bulb started lighting the world in 1879, ushering in a sea change to how chandeliers looked. Artists in this period looked at completely new design ideas from nature instead of bygone eras. Mario Fortuny, an Italian artist, created the dimmer switch and made chandeliers out of ornate silk along with revolutionizing the way theatres were lighted. 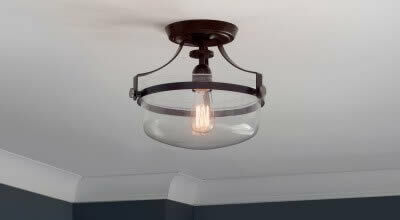 Chandeliers also started to feature downward-facing lights to utilize how electric light bulbs looked and worked. However, Louis Comfort Tiffany looked to the past for inspirations for his designs: Byzantine and Moorish elements, for example. His famous Tiffany lights married the stained glass window with the new light bulb. In the late 19th century, a Bohemian glassmaker named Daniel Swarovski invented a machine that could cut crystals precisely. However, this machine was used primarily to make jewelry at first and Swarovski didn’t even enter the chandelier business until 1965. Fun fact: the first lighting showroom, Bergmann and Company in New York City, opened in 1883. It offered lights that used electricity and gas. 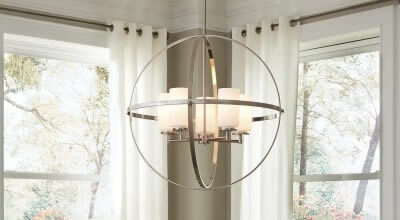 These days, chandelier design can incorporate hints of the past or go off in a completely new direction. There was a notable Rococo revival in the 1930s and Art Deco style, the hallmark of the 1920s, harkens back to the past as well. Modernism grew in popularity in the early 20th century mid-century modern looks ruled the middle of the century (as you may have guessed), but today the chandelier market has room for a little bit of everything: Rococo ornateness, Neoclassical simplicity, Tiffany beauty, contemporary intrigue (see left) and so much more. No matter what era of design speaks to you or what style you like, today you are sure to find exactly what you want in a chandelier, the lighting standout that dates all the way back to when humans lived in caves. Need advice on chandeliers? Contact us or call our trained lighting specialists at 1-866-688-3562. Sign up for our email newsletter today and score an additional discount!